Special black-and-white-only digital fine art camera reviewed by Nicholas Hellmuth. Black and white fine art digital photography. Black and white fine art photography has been popular for decades, actually for centuries. Indeed in the beginning, all photography was black and white because there was no color film in the 1860’s. Today there is a renaissance of black and white fine art photography. Many photographers still work with 8x10, 4x5, medium format, and 35mm film, but digital-B&W is increasingly popular. FLAAR has long ago retired our 8x10 Linhof. The only reason we keep our multiple 4x5 cameras and Hasselblads is to hold digital backs. And one of these digital backs that we have evaluated is a MegaVision E4. It is a dedicated B&W digital back. Medium format digital technology is significantly better for fine art photography than any 35mm SLR camera. Karalynn Repie (BGSU student, VCT, College of Technology) using the MegaVision E4 dedicated B&W 16-megapixel digital back on a Hasselblad ELX in the greenhouse at BGSU. At the right is an example of the results. If you want to produce unique black and white fine art photography, whether fine art figure photography or landscapes or plants, you can distinguish yourself and your fine art photos if you have a unique camera such as the MegaVision. In reality all digital cameras are black and white only. CCD and CMOS censors cannot sense color whatsoever. Digital camera sensors all have an RGB filter arranged in a Bayer Pattern in order to allow the censor to produce color. The sensors then have an additional filter to eliminate moiré patterns. The combination of these filters results in a fuzzy image. That’s why you need unsharp-masking. But if the filters are removed from the sensor, or not placed on the sensor in the manufacturing process, then you get a sharp crisp image, comparable to medium format film. This is the theory. So naturally we were curious to test the dedicated MegaVision E4 black-and-white only digital back. So we loaded it onto our faithful Hasselblad ELX, and now have two reports in PDF format. MegaVision was one of the first medium format digital back manufacturers to produce a dedicated black-and-white monochrome system: E3 Mono, E427, E 4 Mono, E6 mono (39 Megapixels). You can see the MegaVision products at PMA, PhotoPlus, Photokina, or in their Santa Barbara, California headquarters. We have visited with Ken Boydston and Richard Chang at all these locations over the years. 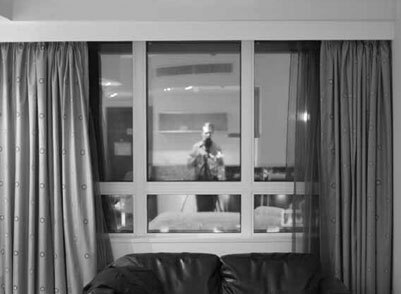 I am testing the MegaVision in my hotel suite in Dubai. Fortunately a nice printer company paid all the expenses for me to lecture at the Middle East sign trade show earlier this year. It was so hot outside I did most of my tests in the room. It is a ceiba tree, the sacred tree of life of the ancient Maya of Guatemala, Belize, Mexico, and Honduras. This tree, with its telltale spikes, is shown in realistic 3-dimensions on incense burners and other artifacts of ceramic from the 3rd century onward. FLAAR is working on a long-range Mayan ethno-botany project. 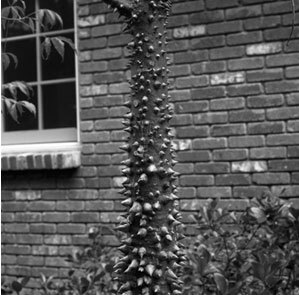 This particular specimen of the ceiba we found in Santa Barbara, California, at the office of PosterJet RIP. But MegaVision digital camera backs are not available from most stores, and we do not have access to new versions to test. So we asked around to learn what other medium format cameras were more accessible, and learned first about Phase One black-and-white digital backs and then I learned about Capture Integration. 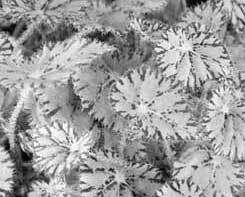 They use a PhaseOne digital medium format back for infrared B&W. This is a Phase One P45+ IR version, 39 megapixels. I have used MegaVision, Hasselblad, Leaf, Kodak, and Phase One digital backs. I have also used BetterLight large format digital backs. Each company works hard to produce their preferences, and I have found good features in each brand of software. But so far, the best software is from Phase One (CaptureOne) and from BetterLight. By “best” I mean, which is sophisticated but easy to use, and which is mature (a polite way of saying, a software that is actually finished and not just a work-in-progress). This consensus is not only mine, photographers select Phase One over other brands of medium format and BetterLight is pretty much the only significant brand of large format digital back in the US (Anagramm holds the market share for Europe). One thing is clear, medium format is still the preferred class of camera for an increasing number of professional photographers. Yes, you can take a good photo with any camera of any brand, but most clients prefer to see their photographer walk in with a medium format digital camera. Of course if you also have a large format digital camera, that is clout too, but most large-format digital cameras are not as portable, and must be tethered. At FLAAR we use all sizes: 35mm digital SLRs, medium format, large format (BetterLight), and even Cruse (super-large format). Jacqueline Najera, the web designer and webmaster of this FLAAR site, also does black-and-white photography. Her pictures can be seen here. Continue on our FLAAR digital-photography.org website for comparative comments on all the other medium format digital backs: Imacon, Kodak, Jenoptik, Leaf, Phase One, Sinar, Mamiya ZD. For conclusions, summary, and practical tips on which medium format would be recommended, again, this is what is covered in the reports by Nicholas Hellmuth which serve as the textbook for the course on digital photography. For over 40 years Nicholas Hellmuth has used Rolleiflex and Hasselblad cameras to record the flora, fauna, and archaeology of Belize, Guatemala, Honduras, and Mexico. Now he is extending his medium format experience to digital photography. Although we started with a Leaf Valeo 22 coupled with a Mamiya 645 AFD body and lenses, we are open to showcasing all bodies as well as other digital backs. Indeed we recently tested an Imacon 4-shot back on a Hasselblad H1 body. Then (February 2006 onwards) we are evaluated a MegaVision black-and-white dedicated back for fine art photography. Currently we are testing a 33-megapixel Phase One P 30. We are also considering the Rolleiflex 6008 AF, one of the outstanding medium format cameras that still offers European precision. FLAAR is the de facto source of information because we are university based, independent, blunt, and we are one of the few review sources that dares to review advertising specs, advertising claims, and advertising hype. We can afford to reveal all the pros and cons because FLAAR is a research institute. Photographers feel they can trust a university research professor who has devoted years to understanding the pros and cons of each aspect of a digital camera system and workflow. Most recently updated February 13, 2009. First posted February 27, 2006. Previously updated June 21, 2006, July 10, 2006, Feb 7, 2008.